Using the E-tec 250mah 2 cell LiPoly Pack for a Hand Launch Receiver Battery Pack. Etec 250 mah 2 cell LiPoly battery pack. I'm experimenting with a lipo receiver pack in my Gambler. 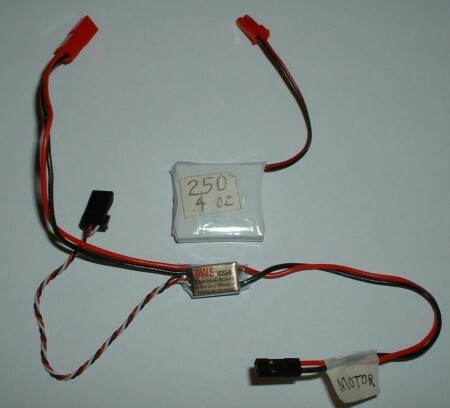 It is connected through a 2 amp GWS ESC to reduce the voltage from 7.4 to about 5 volts for the receiver. The lipo pack is fairly small (1" wide) so it fits in the nose of my Gambler although it must be set on a diagonal to fit. The Pack comes with a male JST plug that matches the female JST plug on the ESC. Rather than take off the power from the motor output, I used the receiver output of the ESC and just plugged it in to an empty spot on the receiver. I pull the red JST plugs apart to disconnect the battery and for charging. 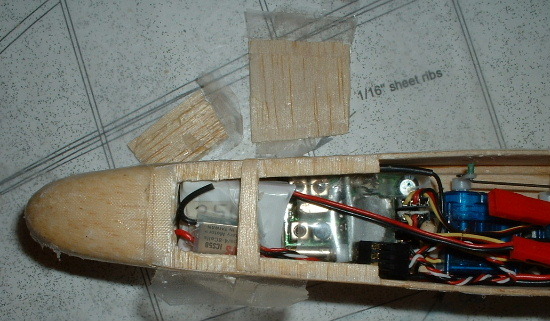 The motor wires were cut close to the ESC, but the other wires were left their original length. Total weight of pack and ESC came to .6 ounces. I charged the pack last Wednesday, flew with it for 1/2 hour on Friday and flew it for 2.5 hours on Saturday. Unfortunately my Radio Shack multimeter just stopped working. On both Friday and Saturday, I started the day by measuring the voltage and I got 8 volts both days. After an hour of flying today, I measured the voltage still at 8 volts. When I tried to measure the voltage after two hours, the meter would not register even with other receiver packs - the thing just died. So I don't know how long this pack will last. After a total of three hours, it still was strong and showed no signs of slower response. Charged the pack. With a new digital multimeter the voltage was measured at 8.03 volts. Flew for 30 minutes the following day. The next day the voltage was measured at 7.81 volts before a two hour flight session. Voltage after 2.5 hours total filght time on this charge - 7.48 volts. The following day I made the mistake of not checking the voltage often and ran the pack down to 5.0 volts after 50 minutes causing loss of capacity to the pack. Charged the reduced capacity pack. The charge took the normal length of time - about 70 minutes plus 30 minutes peaking (Apache charger). The voltage was measured at 8.13 volts. The pack was bench tested for endurance. Bench testing consisted of jiggling the control stick on the transmitter to simulate flight. After .5 hours the voltage measured 7.9 volts. After 1 hour the voltage measured 7.6 volts. After 1.5 hours the voltage measured 7.45 volts. After 2 hours the voltage measured 5.7 volts. The discharge voltage curve is steep after 7.4 volts. Once this LiPoly pack discharges down to 7.4 volts, there is only 30 minutes left at most before the lower voltage limit is reached. There is no warning of slow response with this setup. Since 5 volts is being supplied by the ESC the control response is crisp until a very sudden lack of response. If I do buy another 250 pack, I'll set a limit of 2.5 hours flying per charge. For additional protection, I'd set the lower voltage limit at 6.0 volts. A low voltage monitor would have helped to prevent damage to the pack. The problem with regulators or Monitors that have a LED or button-activated buzzer, is that they still depend on the pilot to disconnect the pack before the Low Voltage Cutoff point is reached. It would be good if someone came up with a circuit that would indicate when the voltage drops to something like 6.5 volts and then shuts down the circuit at 6.0 volts. Then the Li-Poly pack would not be damaged. Another way to indicate the 6.5 volts point, might be to make the servos glitch to warn the pilot. Part of the problem is that there is no control warning that the battery is low. NiMH give a short period of slow response or glitching. At this point I'd settle for a regulator that disconnects the battery at 6 volts. Whether the regulator shuts the battery down at 6 volts or the pack goes dead at 5 volts it is still an instant shutdown of control response. My tests indicate that the length of time between 6 volts and 5 volts is very short anyway. It makes sense to have a circuit to disconnect at a higher voltage to save the pack. My Gambler has a Hitec 555 receiver, a HS-55 servo and a HS-50 servo. For those who want to use this setup in a flaperon dlg, expect half the endurance. Lipoly batteries require lipoly chargers set for the proper number of cells and capacity. Charging these batteries incorrectly can result in an intense chemical fire! Never allow a LiPoly pack to be punctured. In case of a crash, remove the pack from the aircraft and examine it carefully. In case of puncture, place the pack in salt water for at least a week before disposal. Never allow a LiPoly pack to be discharged below 2.75 volts per cell - for a two cell pack that means 5.5 volts. This is the absolute minimum voltage. Anything lower will cause permanent loss of capacity to the pack. Most people add a safety margin.